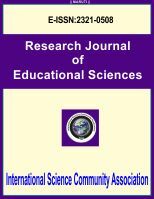 International Science Community Association are publishing an international peer reviewed journal Research Journal of Educational Sciences . It is the vision of International Science Community Association to publish research papers, research articles, review papers, mini review, case study and short commutations in all areas of human study without financial restriction. Coverage Area: Researches in the field of Education Sciences including management of education systems, strategies and policies for education, possible new model of education system, possible different technique implement in education systems, intercultural education and modern technology-based educations, leadership in education, education and information science, child education, adult education, psychology and sociology education, political science and economic education, country development and education systems, etc.